Powers/Abilities: Drom aged backwards since he was exchanged a few minutes after his birth with his elder self. His touch drained the life energy off of living beings and things. To slow down his de-aging process, he had to constantly absorb the life energy of humans. He used many different machines such as translation machines, conversion machines for food, high-tech field glasses, his Chronal gun, the Metabolic Disrupter and a very special mirror. (Marvel Team-Up I#31 (fb)) - A few minutes after his birth, Drom's infant form was, by unknown means, exchanged through time with his future elder self (Drom assumed that it probably happened due to an experiment by a future scientist that backfired). From that moment on, he was an old man that lived his life backwards. For 45 years, Drom lived in seclusion and had to exist in reverse -- he even had to speak backwards. He was dependent on machines that made him understandable, on conversion machines to make food edible for his reversed metabolism, and on human energy to slow down his regression. (Marvel Team-Up I#31 (fb) - BTS) - Drom brought a street thief into contact with Iron Fist to drain the energy from their fight. After the fight was over, Iron Fist was followed by Spider-Man. (Marvel Team-Up I#31) - Drom watched Spider-Man following Iron Fist from a roof. He thought that they could provide him with enough energy to survive and a lot of power. Spider-Man, who was still following Iron Fist, fell right on him after Drom cut his webline with a shot from his pistol. Drom watched the fight between the heroes and absorbed the energy from their battle until they stopped. But Drom wasn't satisfied with that, and while Iron Fist and Spider-Man talked at a playground, Drom used his gun to turn the sandbox's sand into a four-armed monster. Again the heroes had to fight, but after Iron Fist was knocked out by the monster, Spider-Man was able to trap it with his web. Drom tried to shoot Spider-Man from behind, but the hero already suspected that someone else was behind the monster and avoided the shot. The shot destroyed the monster and Spider-Man took his chance to web Drom, but the web turned to dust right before it reached Drom. Spider-Man was surprised and Drom shot him with his gun. 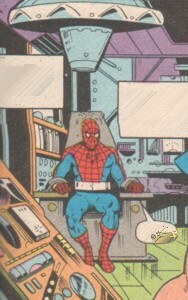 (Marvel Team-Up I#31 - BTS) - Drom brought Spider-Man to his laboratory and put him into the Metabolic Disrupter. (Marvel Team-Up I#31) - When Spider-Man regained consciousness, Drom talked to him -- at first backwards like always, but he apologized soon and then told the hero his life story. Drom then told Spider-Man that he instigated their fights to drain their energy and maybe even slow down his backwards aging process, but because they stopped fighting, he kidnapped Spider-Man to siphon all his energy at once. At that moment, Iron Fist broke through the wall. He disarmed Drom with a kick and avoided Drom's attacks. Iron Fist then freed Spider-Man, but they couldn't fight Drom without him absorbing their energy when they touched him. 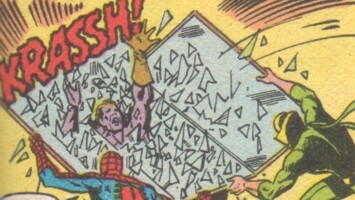 The heroes thought for a second and then took Drom's mirror to attack him with it. He commanded them to put it down because he needed it to maintain an identity and would be swept away from existence without it, but they didn't listen. 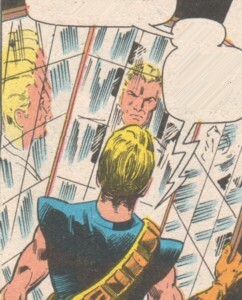 They smashed the mirror over Drom's head, and before their eyes Drom rapidly regressed to infancy and then disappeared (only his costume was left behind). The heroes left and soon afterwards they began to forget Drom because he never existed. Comments: Created by Gerry Conway (writer), Jim Mooney (pencils), Vince Colletta (inks). Drom got a one page profile (not very informative) as one of "Spider-Man's Forgotten Foes!" in Web of Spider-Man Annual#3. He also has a small profile in the Spider-Man Encyclopedia and in the Spider-Man - Back in Black Handbook. Okay, death doesn't mean much in the Marvel Universe, but there is no reason to bring back Drom the Backwards Man. Let's call it a mistake by the writer! I suggest that the Drom in this story was some hobo who found Drom's costume and put it on to get a free drink at the Bar With No Name. I'm pretty sure you can get a free drink there if you're a big enough loser. Or Drom didn't really die against Spider-Man and Iron Fist and was just pulled forward in time. This brings us to another possible appearance. 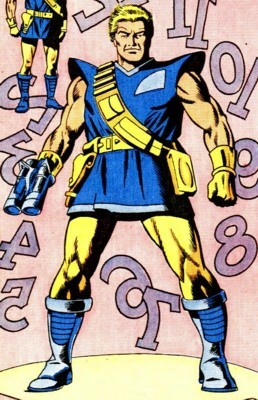 Snood once assumed that one of the captured time travelers seen in Marvel Universe: The End#2 could've been Drom, but he wasn't sure about it. In the Marvel Team-Up Index, Olshevsky notes that Iron Fist remembered some of the Drom story, since he remembered Spidey as a friend when they next met in Marvel Team-Up I#64. It was capable of decaying objects, aging living beings and animating lifeless objects like sand. It was a machine Drom used to break down the cellular structure of his victims. This enabled him to easily siphon off the life energy of those beings. 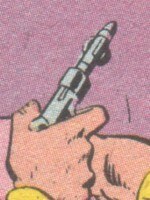 It is possible that he used this machine especially for super-powered beings. It was essential for Drom. He needed it to stay alive, and without the mirror Drom was swept from existence.